Quick, easy to make and healthy. I make this on my busiest weeknights. 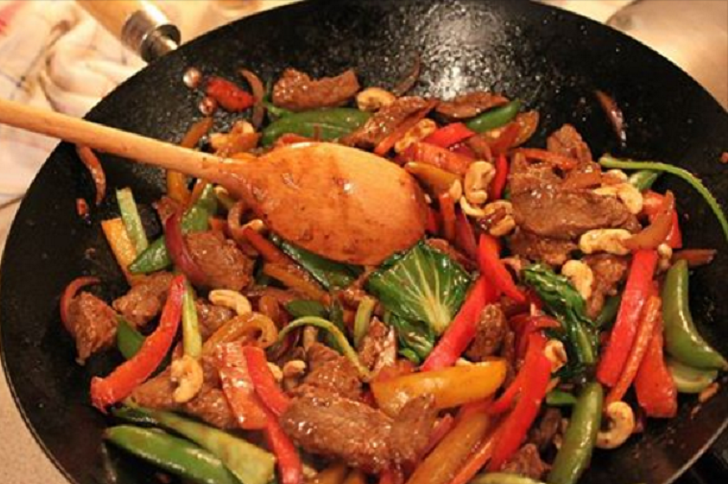 Have dinner on the table in no time with this tasty beef and vegetable stir-fry. Cut beef into thin slices (approximately 2 inches long by a quarter inch wide) and place in marinade. Make sure that the beef is coated in marinade. Let it sit for 20 minutes. Wash pea pods/green beans and pinch off the ends. Chop the green onions and sliced ginger, bell peppers, and carrot. Heat a saucepan over high heat. Drop 1 tbsp. oil onto saucepan. Put meat and marinade in the skillet and fry until brown. Add more oil if necessary. Once the meat has browned, then add ginger and green onions to the meat. Fry 1 minute. Add the snow peas/green beans/broccoli, then carrots and bell peppers. Fry until vegetables are hot but not soggy, then remove from heat. Serve immediately over rice.